The official flag of Tanzania was adopted on 30 June 1964. It was a merger of the flags of Tanganyika and Zanzibar. The flag of Tanzania is divided diagonally by a yellow-edged black band from the lower hoist-side corner. The upper triangle (hoist side) is green and the lower triangle is blue. As early as the 1st millennium BC, the region of Tanzania was already settled by Bantu speaking people that came from the north and west. The coastal port of Kilwa was established in 800AD by Arab traders, while Persians had settlements on the islands of Pemba and Zanzibar. By 1200AD, the distinctive Swahili culture had emerged from the unique mix of Arabs, Persians, and Africans. The first European explorer to reach the region was Vasco da Gama in 1498. The land eventually fell into the hands of the Portuguese. In the 1700's, the island of Zanzibar became the center of the Omani slave trade. During the 1880's, German Carl Peters arrived in the region, and by 1891, it came under the control of Germany, becoming German East Africa. Zanzibar also became a British protectorate in the 1890's - led by the kingdom's campaign against slavery. After World War I, German East Africa came under the control of Britain, and it was renamed Tanganyika. In 1954, rebellions against the British rule began to take place, which was headed by the Tanganyika African National Union. By 1958, Tanganyika achieved internal self-governance, and full independence in 1961. Zanzibar achieved independence in 1963, merged with Tanganyika in 1964, and together formed the United Republic of Tanzania. Tanzania is located in East Africa. It consists of the mainland and a number of offshore islands including Zanzibar, Mafia, and Pemba. Tanzania is home to Africa's highest and lowest points. Mount Kilimanjaro is found in the northeast region, which is Africa's tallest mountain, and Lake Tanganyika is the lowest point at 352 m below sea level. Tanzania's borders include Kenya and Uganda to the north, Zambia, Malawi, and Mozambique to the south, Rwanda, Burundi, and Congo to the west, and the Indian Ocean consists the eastern border - with 800 km of coastline. 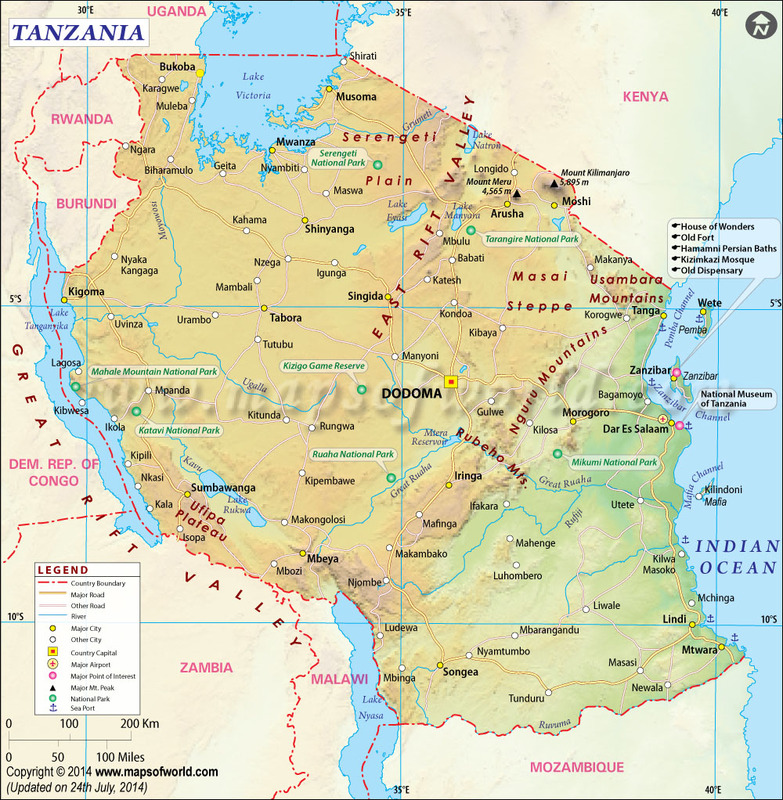 Tanzania is Africa's 13th largest country and the 31st largest in the world. 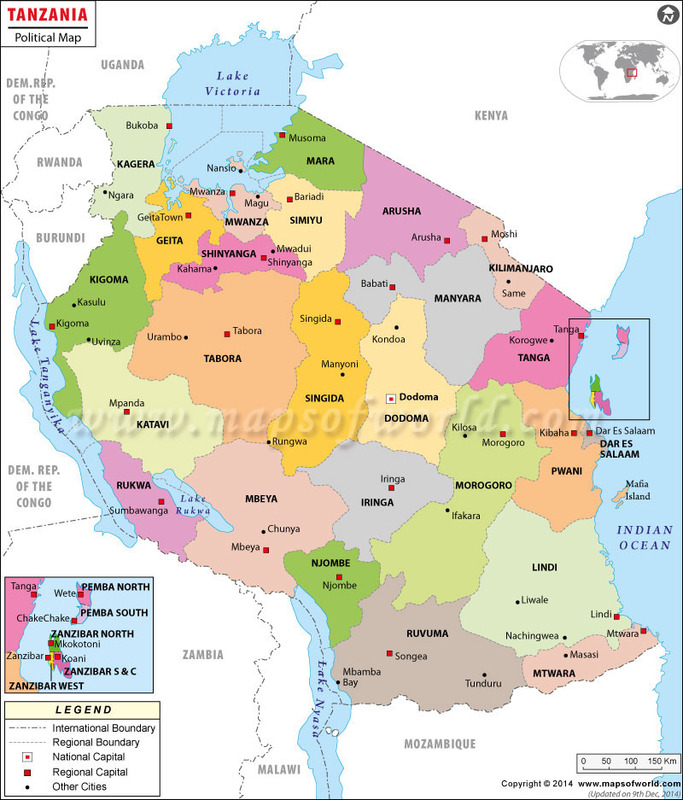 Tanzania is a unitary presidential constitutional republic. The President is head of state and head of government, as well as head of a multi-party system. The President's responsibilities include appointing a Prime Minister, selecting his Cabinet from the members of the 324-seat National Assembly, and nominating 10 non-elected members of Parliament. Executive power is exercised by the government while Legislative power is exercised by the government and the Prime Minister-led Parliament. Tanzania is world-famous for its ultimate safari experiences. But this Eastern Africa nation also offers an abundant offering of historic and religious sites, as well as incredible white sand beaches. For the absolute safari adventure, the Serengeti National Park is a vast expanse of grassland which is home to the annual migration of more than 1 million bearded wildebeest and over 250,000 zebras. Mobile camps are found in the Park to offer days and days of safari adventure for tourists. The highest mountain of Africa - Mount Kilimanjaro has an elevation of 19,340 feet. There are 7 official trekking routes and reaching the summit doesn't require complicated equipment - making it accessible to the regular and healthy tourist. The Ngorongoro Conservation Area is a UNESCO World Heritage Site and considered to be one of the 7 Natural Wonders of Africa. Its crater is the world's largest intact, inactive, and unfilled caldera - and home to over 25,000 animals. Its wildlife offers a fantastic safari experience as well. Zanzibar is one of the most visited travel destinations in Eastern Africa - offering miles and miles of beautiful white sandy beaches and crystal clear waters, it is a favorite among honeymooners and those looking for luxurious resort experiences. The historic center of Stone Town is a UNESCO World Heritage Site and consists of beautiful traditional houses, mosques, narrow alleys, and a Sultan's palace. Mafia Island is one of Tanzania's hidden gems. Since it's not frequently visited by tourists, its strong Swahili culture and natural beauty remain unspoiled. Tanzania's literacy rate for its population over the age of 15 is at 67.8%. Primary education in public schools is free and mandatory but other school expenses such as uniforms, books, and school supplies are not - which still make it hard for families below the poverty line to send their children to school. Since tuition in public institutions is free, the number of students who enrolled in schools increased from about 4 million in 2001 to about 8 million in 2008. However, the increase in student population has not led to an increase in school resources such as books, teachers, and classrooms - leading to crowded schools and students sharing textbooks. The Mpingo Tree, which is native to Tanzania, is the most expensive hardwood in the world. The world's oldest human skull was found in the Olduvai Gorge in Tanzania. Tanzania has the largest concentration of wildlife in the world - with the region being home to over 4 million animals of 430 different species and subspecies.